In my last post I included the recent response from the Chair of Healthcare Improvement Scotland regarding regulation of healthcare in Scotland. Thank for your letter of 14th August 2015. I am grateful that you wrote to try and clarify the issue of the regulation of healthcare in Scotland. From your reply it is clear that we have no external regulation of NHS Scotland. The Board of Healthcare Improvement Scotland will be well aware that in order to comply with the law there must be effective regulation to make sure that legal compliance in Scotland is achieved (HSWA s18). Healthcare Improvement Scotland will also be aware, from page 1 of the second Francis Report, that the situation we have here in Scotland is untenable as well as illegal. The Scottish Government continues to describe Scottish healthcare as “world-leading” when the recent authoritative independent survey, the Nuffield Trust and Health Foundation report of April 2014, provides evidence that reveals starkly otherwise. Healthcare Improvement Scotland will also be aware of the growing concern of the professional bodies. There are the recent reports from the Academy of Medical Royal Colleges and Faculties in Scotland and their concerns on patient safety and quality of healthcare. My understanding is that they have recognised that Scotland has no independent regulator and are urgently looking into the matter. My view is that the current review of the role of Healthcare Improvement Scotland is fundamentally flawed. It does not consider what the legal requirement is to have an effective independent regulator verifying compliance by duty holders with the law and supporting standards. 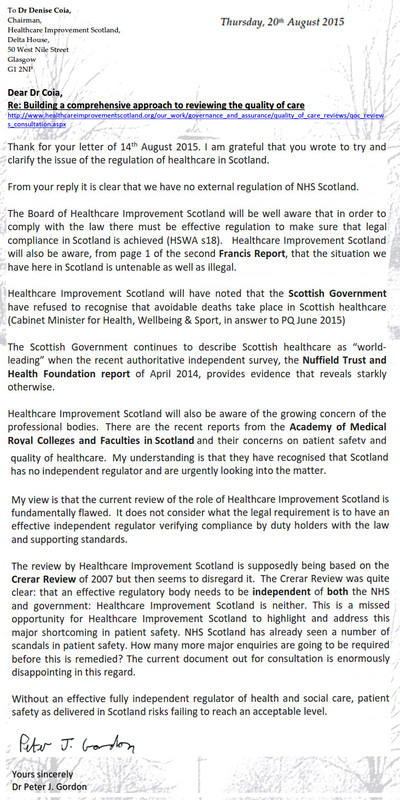 The review by Healthcare Improvement Scotland is supposedly being based on the Crerar Review of 2007 but then seems to disregard it. The Crerar Review was quite clear: that an effective regulatory body needs to be independent of both the NHS and government: Healthcare Improvement Scotland is neither. This is a missed opportunity for Healthcare Improvement Scotland to highlight and address this major shortcoming in patient safety. NHS Scotland has already seen a number of scandals in patient safety. How many more major enquiries are going to be required before this is remedied? The current document out for consultation is enormously disappointing in this regard. Without an effective fully independent regulator of health and social care, patient safety as delivered in Scotland risks failing to reach an acceptable level.